Our Pro Décor decorating range is formulated with Dunlop’s own special Hydroloc™ technology – a pioneering system which means the product dries through chemical reaction rather than water evaporation. Drying times are reduced and finishes dry uniformly throughout, whatever the thickness. 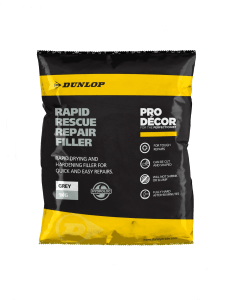 If you’re a discerning decorator with an eye for detail and a head for quality, you’ll no doubt already be a big fan of the Dunlop range. So we imagine that you’ll be as excited as we are about the Dunlop Pro Décor range of professional, quality fillers. The Pro Décor range combines Dunlop’s years of experience, with our new Hydroloc™ technology to not only save you time, but also help you achieve a superior finish. You see, traditional fillers rely on moisture evaporation to dry – and you’ll be more than familiar with the problems that causes. Too much moisture and the filler will slump, but too little and it will crack. Not to mention the amount of time you spend just checking to see if it’s dry, which can sometimes be days! With Pro Décor there’s no danger of cracking or slumping, meaning a perfect finish everytime. No water evaporation means less shrinkage, so there’s no need to overfill and then spend ages sanding it down – or worse, refilling. The drying times are fast and consistent, meaning you’ll know exactly when your surface will be ready for painting or wallpapering. Damage as deep as 80mm can be repaired and ready to paint in as little as 2 hours, without building up or applying further layers. Unwanted backgrounds, such as artexed or textured wallpaper can be smoothed over, with ease, and ready to paint the same day. The finish is so tough and durable that it can be drilled, nailed or screwed after just 24 hours. Some products in the Hydroloc range can even be shaped and carved, making it easy to repair damaged coving or fake a missing piece of skirting board. The possibilities are endless! Less waiting, less priming and less sanding means you create a consistently great finish faster than ever before, allowing you to finish the job more easily and more quickly.